An amplifier on it's own isn't a lot of use. For gigging it needs a loudspeaker in an enclosure and a case for the amp itself to make it easy to carry and to protect it from the rigours of the road - in short packaging. Here we take a look at the different forms and variants that can take, and discuss some of the practical strengths and weaknesses of each. 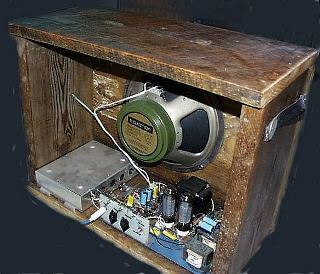 A “Combo” or combination is an all-in-one package where the amplifier and speaker are mounted in the same case. This format tends to be most practical for smaller, lower-powered, amps. A combo case will generally use slightly less materials to make and therefore be somewhat lighter to carry. This allows the guitarist to arrive at a gig with guitar in one hand and combo amp in the other (and gig bag slung over the shoulder). This “all-in-one go” is generally helpful at gigs moving from the vehicle into the venue in a single lug, and the only practical way of moving your gear if you ever have to use public transport. The main disadvantages of the combo are in larger powers, such as the Fender Twin, where the combined weight of the amp and speakers can just about dislocate your shoulder in the short distance between the vehicle and the venue. Larger combo's are also less flexable when it comes to packing your gear into a vehicle, particularly if you have to use a car rather than a station-waggon or van. 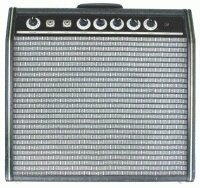 With the exception of combo's like a Farfisa that had a detachable preamp section, the combo format also means that the amp controls have to be where the loudspeaker is. This means that you often have to strike a compromise between putting your amp in the best place to operate the controls, and the best place to put the loudspeaker for sound in the venue. 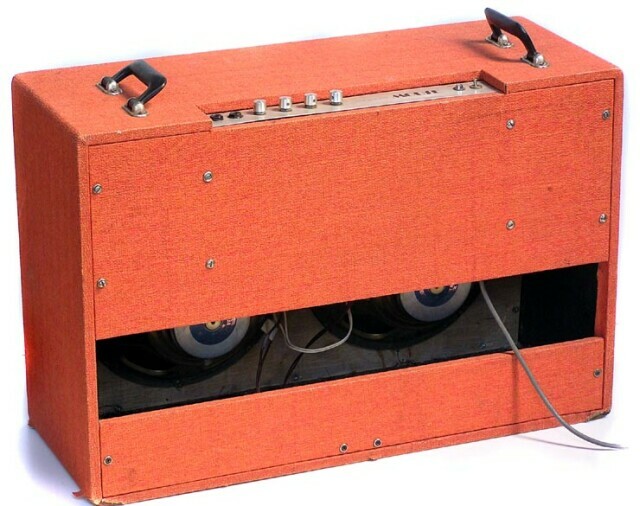 Normally speaker position will dominate, so you will sometimes find yourself in situations where your amp controls are difficult, or even impossible, to get to while you are playing. This is not good for your overall performance. Possibly the most minimalist form ever was produced by Goldentone in their early “suitcase” line. Actual suitcases are a dime-a-dozen at your local op-shop and if you can find a suitably solid one with a detachable lid (or modify with pin-hinges) this would make a very neat package particularly for a harp player or guitarist with undemanding requirements (or needs the ultimate cheapness). Because of the lack of case stiffness this form is quite unsuited to bass or keys. Somewhat more up-market is the case built from ply. Of course you don't have to mount the amp across the top, although the controls would generally be more accessable that way, but combo's are often put up on something like a chair to get better sound projection and foldback for the player. In smaller venues such as coffee lounges it can be practical to place your amp in front of you, and particularly if you normally sit to play, a combo with rear-facing controls can be practical. 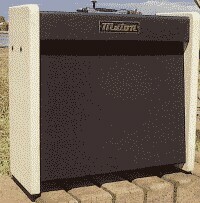 This particular Maton rig has a very attractive front. Front controls are best when your amp is behind you in the backline. Rear controls are best when your amp is normally in front of you. The compromise is to place the controls on the top, generally towards the rear like this Mielnik Vedette. All of the above have only a single speaker, but there is no reason why two, or more, speakers can't be used to good effect. This is particularly true for bass and keys where the same volume of air is moved for half the cone displacement leading to a cleaner sound. The most common arrangement is side-by-side. Having a couple of speakers also allows the building of a case that gives better dispersion of your sound. Although the odd shape would be more difficult to pack, this British-built Watkins Dominator-V layout would make the best use of limited output power. 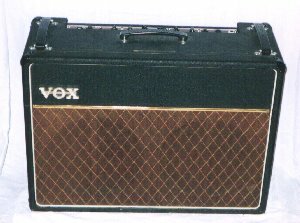 Another Brit, the classic Vox AC30, also used this format. Note also the vertical bars protecting the speakers, and the provision of three handles on the top. The upright “tallboy” format is helpful if you play a lot of venues where stage space is tight, and is easier to pack for transport than more cubic designs. A serious drawback of having front controls is that it is almost impossible to prevent air leaking between the top of the speaker baffle and the bottom of the control panel/chassis. 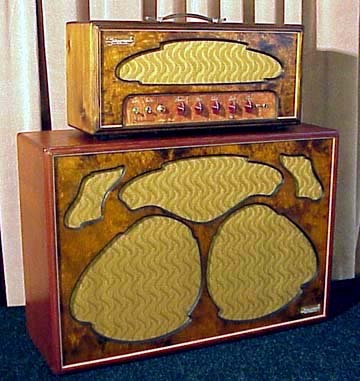 While it makes the rig taller, a good way to overcome this problem is to include a panel between the amp and speaker, making a transitional form between combo and head-and-box. This allows the speaker to be sealed or properly vented, while allowing the amp itself adequate ventilation. This also allows the amp chassis to be mounted on the partition rather than suspended from the top, and this may be useful if you have built your amp on a baking tray chassis where the sides are somewhat angled, leading to an upward presentation of the front panel. Of course you aren't limited to just two speakers, nor do you have to put them on the square, as this very pretty Maton with three speakers on the skew illustrates. 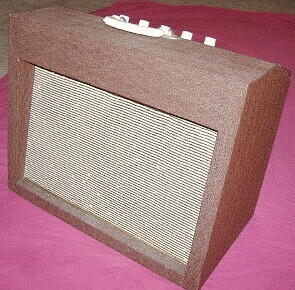 When 8-inch twin-cone speakers were common and cheap Goldentone really let their heads go. While not suited to bass or keys this would go really well for harp and be satisfactory for guitar. 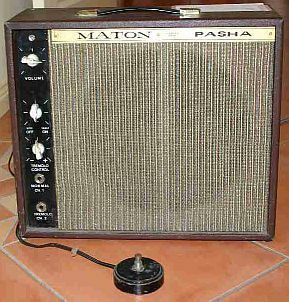 As guitar amps grew bigger and heavier the head-and-cab format became more popular due to the combined weight of the rig. This can also have advantages when it comes to packing your gear in a vehicle; the cab can go in the boot (trunk) and the head can go on the floor in the back (well, in old Holdens and Fords it can anyway). These really only come in two forms, suspended from the head top, and mounted on the head floor (like a Marshall). 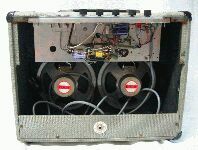 This Electravox BR40 shows a typical arrangement with the chassis held in place by long bolts through the case top. VASE used both suspended and floor formats, here in the Dynabass 40. As noted above this form of chassis mount is suited to amps built on baking trays where the sides splay outwards. 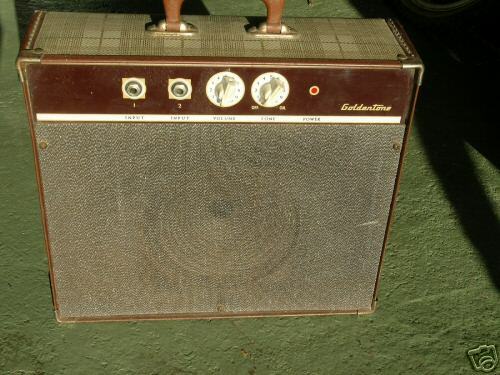 Goldentone were about the only builder to make specific provision for amp leads, possibly because many of their amps had a very heavy cast steel footswitch on a fixed lead which posed a real risk of smashing a valve in transit. In a combo design leads can simply be coiled into the base of the amp, but you really need a skirt piece across the bottom back to keep them there. 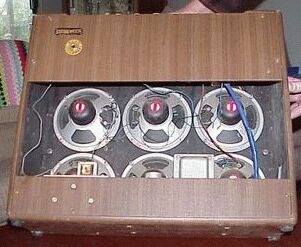 Goldentone heads often had a special cavity for the footswitch and this one had a spring-hinge door (at right) to keep the heavy footswitch in place (the mains lead fitting between the power transformer and the end of the case at the left-hand end). Lastly, here are a couple of examples of opposite extremes in amp cases. I have very mixed feelings about this one. On the one hand it's really great that someone has had a go, and it's a good example of how rough an amp can be - and still work. 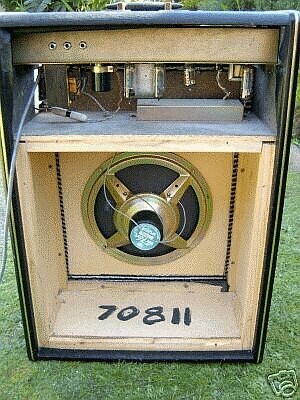 But it's no way a gigging amp, and an object example of how not to build one. Built out of railway sleeper I can't imagine what it weighs - it looks unmovable - and all that exposed high voltage! It's much more a science fair project than a gigging guitar amp, more prototype than end product. If there's a message here, it is to carefully study what amp builders have developed over time from operating and building experience, learn from them, and try to have a clear idea of what you want to end up with when you have finished building.